On a planet that is dominated by water, determining how the oceans interact with the atmosphere is critical if we are to understand the climate of the Earth. All ocean-atmosphere exchange occurs through the sea surface microlayer that is less than 1 millimeter thick. However, many gaps remain in our understanding of the sea surface microlayer and how it impacts interactions between the oceans and the atmosphere. One such gap is whether there are differences in the sea surface microlayer between daytime and nighttime. This is the topic of the interdisciplinary Sea Surface Microlayer at Night (MILAN) project conducted by an international team of marine and climate researchers (ACES researchers among them) led by the Institute for Chemistry and Biology of the Marine Environment (ICBM), University of Oldenburg, Germany. “The project was the result of some informal discussion at an international conference which also makes it rather unique,” says Matt Salter, researcher at ACES and participant in the MILAN project. The sea surface microlayer has chemical, physical and biological properties that differentiate it from seawater just centimeters below. Both natural organic compounds and manmade toxins have chemical structures which result in them accumulating at this surface. Bacteria and viruses are also known to be enriched in the sea surface microlayer relative to the seawater below. Importantly, these different properties have repercussions that are critical for the exchange of mass between the oceans and the atmosphere. As part of the project, scientists from ACES will investigate how biological, physical and chemical processes affect the amount and type of sea spray aerosol particles emitted from the sea surface microlayer. To do so, they will utilise the ACES sea spray chamber during the two week project to generate fresh sea spray aerosol particles. Specifically they will investigate the links between the composition of the sea surface microlayer and the composition of the sea spray aerosol particles. They will also probe the role of photochemistry on the composition of sea spray aerosol using unique instruments available during the project. “Our understanding of the sea surface microlayer is limited because it is challenging to sample the very surface of the ocean. Trying to understand whether it is different at night will take that challenge to a new level! ” says Matt Salter. MILAN started on March 27th and will end for now on April 13th 2017. The Sea Surface Microlayer at Night project was initiated by Mariana Ribas, an oceanographer at ICBM and Christian Stolle, from the Leibniz Institute for Baltic Sea Research (IOW). Researchers from Costa Rica, Denmark, Great Britain, Italy, Croatia, Poland, Sweden and Spain currently constitute the team. Besides project instigators Ribas Ribas and Stolle as well as the Head of the European Research Council (ERC Starting Grants) funded Sea Surfaces Research Group, Dr. Oliver Wurl, there participate further scientists from the University of Oldenburg, the GEOMAR Helmholtz Centre for Ocean Research Kiel, the Leibniz Centre for Tropical Marine Research (ZMT, Bremen) and the Leibniz Institute for Tropospheric Research (TROPOS) in Leipzig. 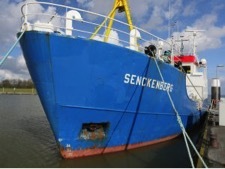 The Project team has the research cutter Senckenberg of the Wilhelmshaven Senckenberg Institute at their disposal. The scientists are going to deploy a special sensor-equipped drifting buoy as well as a remotely operated research catamaran of the ICBM research group sea surfaces from aboard the vessel. The catamaran collects major amounts of the surface layer for lab investigations. Moreover, delimited earmarked university funds permit the use of ICBM research boat Otzum. The MILAN experiment will make its results and data openly accessible to the scientific community.